Welcome to LUC Wholesale - Live Unique & Create! Monogrammed & Logo Blanks & Gifts for everyone! CLICK HERE for Printable Catalog! Welcome to LUC’s Wholesale Monogrammed Gifts & Wholesale Monogram Blanks! LUC’s wholesale unique & BLANKS creative BLANKS allow you to Live Unique & Create your own customized Unique Monogrammed Whimsical OR Logo Corporate Gifts. Decorate LUC’s Monogram Blanks with Vinyl Decal, Vinyl Heat press, Embroidery, Silk screen or Dye Sublimation to create that special touch. Our Exclusive & Innovative Neoprene Cooler Totes are Functional Fashion with a Monogram! Use the NEW Oversized Neoprene Tote as a Cooler with any freezable Cold Pack to keep things cold anywhere on the go. To the Beach, Park, Picnic, Sporting events, Tailgaiting & more! LUC’s unique Fashion Neoprene Tote is Fashionable & Fun anywhere! LUC’s Vinyl Decal Jewelry Blanks can be monogrammed & the Monogrammed Snap Jewelry is interchangeable into a ring, bracelet, necklace or dangle charm! Our Beer Sippy, Wine Sippy, Stemless Wine Sippy & Martini Sippy Cups are BPA-Free Acrylic. 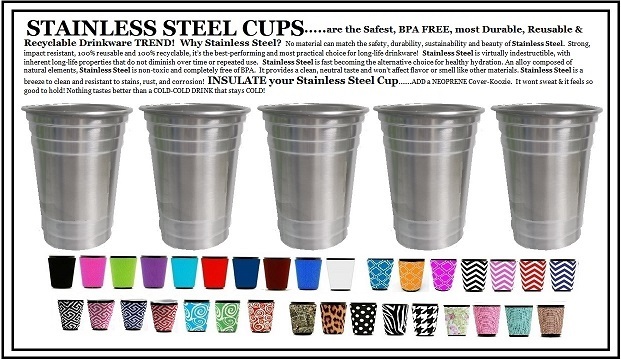 No more broken glass on patio, pool or boat with our “Adult” sippy cup’s. Keep the sand out of your glass at the beach or park! Our Wholesale wine & beer sippy cups fit in most cup holders even our wholesale beach sand spikes. Sippy Lids keep bugs out and prevent spills on wine sippy, beer sippy & martini sippy cups! Wholesale Infusion Sippers allow you to add a natural tasty experience to enhance the flavor of your drink with fresh fruit, herbs & spices! Our Sports Beverage Coolers are ready to quench your thirst at lunch, during workouts, on the go or at your favorite sporting event! Sports Beverage Cooler holds 1/2 gallon easy to put your favorite vinyl monogram or monogrammable wholesale neoprene cover. If you LOVE the Beach! You'll love our Sand Spike Hold My Drink beach beverage holder. Our Wholesale Sand Spikes are great for holding your favorite drinks, sunglasses, Wholesale beer sippy cups, Wholesale wine sippy cups, cell phone & more! Our Wholesale monogrammable beach beverage holders can also sit between sofa cushions to hold TV changers & drinks! We Have Fabulous & Fun, Creative & Unique Wholesale monogrammed Gifts & monogrammable Blanks for everyone (including yourself). Our Wholesale Monogram Embroidery Blanks will fit any machine. • Beach cup holders and more! • Baby Bella Thermal Tub Coolers have a monogrammable front pocket! • Wholesale Vinyl Decal Monogram Jewelry will add that personal gift touch! • Dog & Pet Products! Monogram Dog Bowls & Monogram Pet Mats! If you're looking for something fun and creative for a friend, your family, Wedding events, Birthday event or even just a treat for yourself, LUC has just what you're looking for! Enjoy browsing our wholesale online store and if you need any assistance, please call 843-856-7499 843-856-7499. Let's Have a Party! Our Exclusive Wholesale Neoprene Solo Cup Koozie Sleeve fits any 16oz, 18oz & 24oz Plastic Party Cups . Our Koozies are Monogrammable! They are a great addition to any party theme. Our Wholesale Solo Cup Koozie sleeves are perfect for both hot and cold beverages. Add our FUN Colored Party Featuring Our Wholesale 6-Pack Neoprene Coolers practical & perfect for Tailgating, Beach,Picnic, Parties & more! Dress up your Wholesale 6 pack cooler or Sports Beverage Cooler with a monogram or logo. It can be personalized on the neoprene stretch cover. Just place the removeable freezer pack insert in the freezer a few hours before use & the built in ice cooler will keep your drinks cold all day. A Must see gift. Our Exclusive Ice Bucket cover for your 1 gallon Lucite or Wholesale Aluminum bucket. Our Ice Bucket covers come in a variety of fun colors! Changeable ribbons add fun, festive flair to any party or occasion. Our Small Thermal Tub is insulated for keeping your perishables cold. Great for a lunch tote! Leakproof! It has a velcro closure. Can carry wine or a Wholesale 6 pack of Drinks! Many of our products are made in the USA…OR… distributed exclusively in the USA.